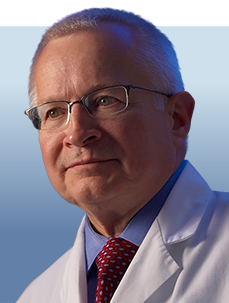 Daniel D. Von Hoff, MD, is physician-in-chief and director of Translational Research at Translational Genomics Research Institute (TGEN). He also serves as chief scientific officer for US Oncology and for HonorHealth’s Clinical Research Institute and is a clinical professor of Medicine at the University of Arizona. Launched and developed with colleagues many anticancer drugs now used routinely, including mitoxantrone, fludarabine, paclitaxel, docetaxel, gemcitabine, irinotecan, nelarabine, capecitabine, and lapatinib. Played a particularly instrumental role in the development of gemcitabine, the first drug to improve the survival of patients with stage IV pancreatic cancer. In 1997, Von Hoff and colleagues demonstrated that gemcitabine increased the clinical benefit and improved overall survival compared with fluorouracil (5-FU) in patients with pancreatic cancer. Helped develop the concept of personalized therapy for patients with refractory cancer based on using molecular techniques to profile their malignancies. Founding director of the Institute for Drug Development at the Cancer Therapy and Research Center in San Antonio. Has published more than 600 articles, 1000 abstracts, and 130 book chapters.